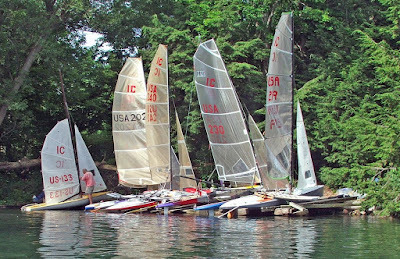 There are other blog(s) that rightly cover the Laser class with great enthusiasm, but the Laser Master Worlds start tomorrow up in St. Margarets Bay, Nova Scotia, Canada and it is only natural you keep track of sailing buddies. In my case, I'll be tracking Favored End in the Great Grandmasters, an old International 14 competitor who took up Laser sailing about two years ago and has took to it, as they say, like a duck to water. I'll also track the scores of Severn Sailing Assoc competitors; it's a hometown thing. Here is a short video of the just completed regular Laser Worlds at the same site (they call this the Senior Championship). 2009 Laser Worlds Championships - seniors from Julian Gibbs on Vimeo. For the select few that have been following the blog for more than two months, I wrote of a vexatious stint as Vice Chair for the Laser Atlantic Coasts . Shortly after this, my good friend Eric Arens visited from the West Coast. I related our difficulties in controlling the Laser fleet and Eric was quick to tell me how it should have been done. Eric was the PRO for the 2005 Etchells 22 Worlds and it turns out he doesn't believe in using the Black Flag to control those who wish to test the Race Committee on the start line. His solution; a mid line boat with spotters and recorders (with tape recorder backup) looking both port and starboard to the RC boat and leeward end of the line, spotters and recorders on both the RC boat and leeward pin boat looking toward the mid line boat. First start, Eric caught about 15 Etchell's over the line and given the high profile sailors Eric had rounded up (including Dennis Connor) he was duly protested multiple times for redress. He showed up with the tape recorders and the lot of them were thrown out. Needless to say he had few problems for the rest of the regatta.... though Dennis Connor cornered him at a party and groused that he had ruined his regatta. 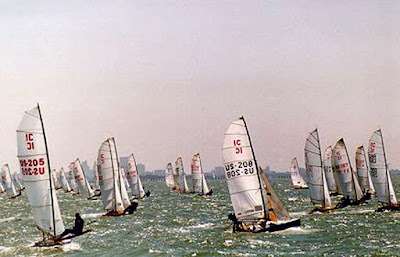 Ken Legler, PRO for the 2009 OPTI's, has the same philosophy and wrote a short article on it. A very well argued plea and a well thought out plan to capture all the starting line cheaters and throw them all out. And, oh by the way, did I mention Eric was the PRO for the 1993 International Canoe Worlds and did I mention he scored me OCS on my best race of the series, (he said I was over by about 1-2 feet). The genius just radiates through this video. Amy Winehouse and her signature hit "Back to Black". First, the Brits are sailing mad. It's amazing the numbers they get to sail on puddles, gravel pits, and very narrow winding rivers. Secondly, here is a scow class that didn't originate in the U.S.
rigged scows navigating the back and forth of the Hull river. The title quote is from Douglas DeCouto, participant at the ongoing 505 Worlds on Berkeley Circle, a big wind destruction derby, crash fest, heavy air smackdown that is San Francisco Bay in August. The SAP 505 World Championship has the most comprehensive web reportage of any dinghy sailing event I've come across; with professional video by Tucker Thompson posted every day, photos and photos and more photos, and geeks on Sailing Anarchy that seem to have nothing better to do than twitter all the mark rounding positions. I sympathize because I sailed the 1993 International Canoe Worlds on San Francisco, held also in August. We lucked out and didn't see any of our races blow over mid 20's and most days the first beat would be in the teens and then build quickly into the 20's after that. The problem with Berkeley Circle is boats like the 505 and International Canoe are too fast for the track; i.e you can't really steer around the short chop upwind because you are onto the waves too quickly so you alternately launch or plow and sometimes in the big gusts, stagger with most of the rig luffing. Downwind it's the same story but you are going so fast that launching or plowing at the wrong time is disaster. The good guys were able to keep the pedal down but I found it faster to back off and pick my way downwind. And the water is cold! Douglas's interview fits San Francisco dinghy sailing to a tee; blasting exhilaration ending in some disaster, you're swimming and not quite sure how it happened. For Douglas Decouto and all the other 505 mid fleeters the regatta becomes somewhat of a grind, trying to put the debacle and the carnage of the last race behind and soldier onward. I finished about half the races in the 93 IC Worlds (I did have two races I can file in the sailing memory bank compartment marked good). I wasn't physically up to the rigors, which wasn't a big surprise. The IC Worlds was just the middle part of the grand adventure of driving cross country with my family. And the sailing and the trip all add up to great memories. Unlike the wooden MIT dinghies , where it seems about half a dozen remain in the U.S.; over in Europe the International 12 dinghy is a vintage lapstrake dinghy that is going from strength to strength. Designed by George Cockshott, an amateur boat designer from Southport, England, over ninety years ago, there seems to be a healthy mix of wooden and fiberglass International 12's. The Italian championship looks to turn out a fleet of about 40, not bad for a gaff rigged singlehander with a hull weighing over 200 lbs. If I was perchance to get an offer to do the Italian championships, I would do my utmost to make the trip; sailing be damned.... all that Italian red wine and food..... kidding aside, it would be neat to race a gaff rigged singlehander with very sweet lines. Here is a well done YouTube of a fellow daysailing his wooden International 12 around Rotterdam, Netherlands. Another post on the International 12. The International 12 in a header photo. As the 12 meter yachts will be forever linked to Newport, Rhode Island, the North American decked sailing canoe and its modern incarnation, the International Canoe, will always be inextricably linked to a tiny inlet on Sugar Island called New York Bay. Bay is a grandiose term for a body of water you could easily throw a baseball over, but it has been the center of decked canoe sailing for over a century. During the July ACA encampment, the International Canoes race for trophies that arguably are the oldest in small boat sailing; the Crane, the Mermaid, the Butler, and the Championship. The campsites for the decked canoe sailors and families ring New York Bay. There is a constant bustle of kids swimming, kayaks coming and going, boat tweaking for the next race. On one side of the Bay are the wooden floats where most of the IC's are kept. On the promontory, just beyond the floats, is the Steve Lysak cabin with a expansive view of the St Lawrence. There is a small beach where kayaks and IC's on dollies reside. New York Bay is tucked away out of the prevailing southwesterly's, so much so that one can leave the sails up during the day with no excitement. Some photos...... As always you can click on the photo for higher resolution. From the Edwin Schoettle book, Sailing Craft, published in 1928, there is a photo of the floats on New York Bay filled with 16X30 decked sailing canoes. The tent on the left occupies the same space the Steve Lysak cabin sits today. Looking out from New York Bay onto the St. Lawrence. Marilyn Vogel sailing her ACA rigged open canoe. The Canadian town of Gananoque is about 2 miles in the distance. Finally, International Canoes launch for the afternoon races. Note the varying techniques to navigate out of the windless New York Bay. Note; There is an error in one of the titles of the video. Sugar Island is in Canada, not New York. Although the sound track seems grafted onto the video (where are the backup singers? ); a young, manic Mick Jagger doing a chicken dance and a bemused, somewhat exasperated Peter Tosh makes this video fun to watch. I didn't go to Woodstock. It was the summer between high school graduation and starting college .... I was still under my parents thumb, still looked like a high school geek and, quite frankly, I don't like big crowds. I have a dim recollection of knowing people who did go and my impression from their anecdotes was it was a chaotic, mind numbing, sleepless, muddy, squalorous; a weed, mesc and LSD saturated party. Most of the quarter million never got close enough to hear the music. Still, when you catch me watching the Woodstock movie, you will see my absorption; for this is my generation, my tribe in all it's colors, and radical righteousness, and hippie zaniness, and Woodstock marks the beginning of a questioning voice I would find later in college. MIT collegiate sailing at the close of WWII. I wonder if any of these Tech dinghies survived? Beautiful examples of wooden boatbuilding! 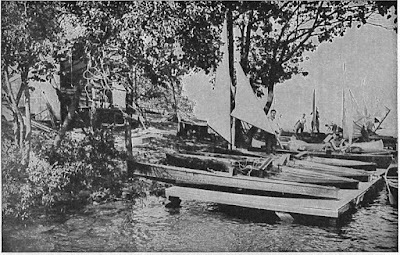 Addendum: For those who don't bother to check the comments, the eminent blogger Tillerman has ran with my question on early Tech dinghy history and, through diligent research and his knowledgeable readership, has put together a very thorough tracking of the current whereabouts of the wood Tech dinghies. here. Also, one of Tillerman's readers, O Docker, has pointed out the existence of a very fascinating video of the early days of MIT and collegiate sailing. Narrated by Hatch Brown, MIT sailing master in the early days, this video is for anyone with a love of sailing history. Watch the full 35 minutes. Go to this link and download the Full Version with Commentary. Is this in the US Sailing RC Handbook? August doldrums so I've been lazy about blog writing, though I do have some subjects queued up in my mind. To fill the gap, I'll take the easy way out and tap into the YouTube bookmarks. First up, how to make race committee a must do assignment at your club. I think this is in Hawaii. Another great! Bo Diddley sure could make that guitar talk. Seven Classic Moths made it to Severn Sailing Association on Sat, Aug 8 for a one day regatta. Forecasts in the week leading up to Saturday looked good for a moderate Southerly but the day dawned overcast with a light Northerly that swung to the NE at the 11 am start time. It was going to be the August "Shake and Bakes". Unfortunately Race Area C at the mouth of the Severn River becomes a conflicted tactical nightmare on these days especially when the sun finally poked through and the day started to heat up. On the left was a stronger NNE river wind and on the right was some indication the Bay winds were trying to align the median wind rightward, more towards a southerly sea breeze. Mike Parsons parlayed the left side, river breeze shift, and some good light air speed to win the first race in a squeaker over John Z. In the second race, the two homies, John Z and your humble scribe were betting the right would pay off and 1/2 way up it looked good but the left came in again for Mike, late in the leg but there nonetheless. Mike had a 100 yard lead but, in the dying breeze, mistook the finish line as the RC shortened course. My one time in the whole regatta I was ahead of John Z proved fortuitous as I was able to finish correctly just ahead of Mike, who was unwinding his false detour. As they say, it is better sometimes to be lucky than smart (or fast). Before the third and final race, the wind did swing right to the east but the pressure remained light. Mike ran away and hid, John Z finished second and I followed in third. So Mike wins the day. With my 2nd race win, I win the tie breaker over John Z and George Albaugh wins the Gen 1 division. Race committee, as always at SSA, was superb. Tip of the hat to PRO John Quay and his crew. I've been somewhat remiss lately on hitting the weekly music posting. To cover last week, Friday is now on Tuesday. A Swedish band and a particularly good toe-tapping, hopping rendition of the Chuck Berry classic "Let it Rock". Featuring guest guitarist Albert Lee. I enjoy old sailing photos, more so if they features places and boats I've never seen. The last photo was taken by me in about 1960 on the Port River. A couple of Rainbow scows and Cadet junior dinghys feature. The old steamship is the S S Karatta which carried freight and day passengers from Port Adelaide to Kingscote, Kangaroo Island from 1907 to 1961. It was then replaced with a roll on roll off ferry. I was off last week, camping on Sugar Island, Canada. 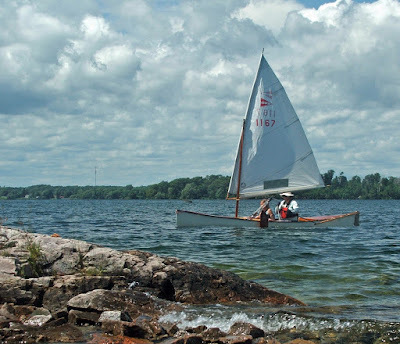 Sugar Island is part of the Lake Fleet chain of islands in the Thousand Islands and is owned by the American Canoe Association (since around 1903) and they have been hosting the Annual Encampment even before that time. 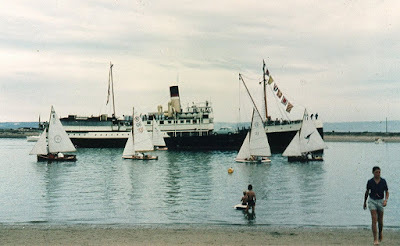 In the 1920's and 1930's, the Encampment was a big deal; canoe clubs from up and down the East Coast attended, paddling and sailing competitions were held over the two weeks, there was a large dining hall and a ferry stopped over at Headquarter Bay to take on and offload passengers. Plus, during the Prohibition, Sugar Island was just inside Canada and you could legally imbibe alcohol, something that was readily enjoyed by American canoeists. Today the Annual Encampment is on a much, much smaller scale, most of the canoe clubs from the past are long extinct, the dining hall either burnt down or was razed and the Island has returned to a wilder state, replete with raccoons, mink, deer. The International Canoes (I know they don't look like canoes but their heritage is very definitely grounded in the sailing canoes of yore) race the first week for some very old trophies. I haven't owned a race boat Int. Canoe since the mid 90's so I attend as a Int. Canoe alumni and help with race committee, connect with old sailing buddies, kibbitz with the current crop of International Canoe sailors and paddle my surf ski hither and yon. More about the Encampment later but here is a video of my campsite. Oh, I forgot to say that they cliff dive (into the water) off of Island 48. International Canoeists are masochists but they usually don't throw themselves off cliffs to the ground below. 1. Finn GBR 41 sailing dead downwind - or nearly so - in surfing and planing conditions (Judges so state after the yellow flag at ~ 45 seconds into video). 2. There is some rocking of the boat, apparently induced by the skipper. Since the boat appears to be changing course - to windward when heeled to leeward and vice versa - when this is done, the boat does not break any rule. See RRS 42.3(a) (and ISAF Interpretation Rock 6) which permits the boat to be heeled to facilitate steering. This is an exception to the prohibition on rocking found in RRS 42.2(b)(1). 3. The judges are focusing on the skipper's actions with respect to the sail - specifically pumping. According to the ISAF Interpretations of Terms Used, a pump is a single pull [usually vigorous] on a sail unrelated to wind or waves. RRS 42.2 (a) prohibits repeated fanning of any sail by pulling in and releasing the sail. See Interpretations Pump 1 and Pump 2. 4. RRS 42.3(b) permits one pump - but only one - for the purpose of initiating surfing or planing. One judge can be heard counting the number of pumps [at least two, possibly three] on the same wave. This breaks RRS 42.2(a). In addition, since the boat is already surfing or planing, the exception in RRS 42.3(c) is not available but, if it were, only the first pump would be permitted. The ISAF Interpretation of RRS 42 may be found here http://www.sailing.org/2004.php They are dated 2005 but did not change for the 2009 - 2012 period. Tip of the hat to Hugh for imparting this wisdom.